Worried about ‘stray dog death squads’ ahead of FIFA World Cup in Russia? Here is what is very likely to happen. Blood-chilling articles, like this and this, are starting to pop up, denouncing “Russian government to ‘slaughter stray dogs en masse’ ahead of World Cup” and “Putin to deploy ‘canine KGB death squads’ to butcher thousands of stray dogs in football World Cup host cities”. The founder of the leading animal welfare charity working in Russia and the former Soviet region, Anna Kogan Nasser: “Yes, tenders to provide dog catching services have been put out”. The official line is: “stray dogs will be captured, put in temporary shelters and released after the World Cup is over”. Capturing to be kept without food, water and care for the duration of the World Cup (1 month), after which, those dogs who didn’t die on their own will be released back on the streets. The amount of money allocated for these tenders is simply not sufficient to cover any kind of care or even food for hundreds if not thousands of dogs. We doubt the killing will take place on the streets in the daylight (at least not in most cities), as it would cause too much of an outrage, but it wouldn’t be entirely surprising if it did. Euthanasia is very unlikely to be transparent or, for this matter, humane, because the subject of humane euthanasia of unwanted animals has been demonized and tabooed by the extreme Russian animal rights activists for years. They don’t want it to happen at all and never want to discuss compromises and complex approaches to dealing with enormous stray population. According to their statements, dying slowly on the streets of hunger, illnesses, cold or abuse is more humane, than quick and painless euthanasia for animals whose chance of finding a home is close to zero. Sounds grim, doesn’t it? Well yes, it does and it is. Two years ago, knowing that we would come to this, Forgotten Animals (Big Hearts Foundation back then) proposed a joint project to two large international animal welfare organisations, who at the time agreed, that the best way to prevent the upcoming atrocity would be to start a large-scale project in one of the World Cup cities. Given the scale of the problem and various cultural and political barriers the project would have shown how to tackle the issue over time and sustainably. This approach prevents the knee jerk reaction that seeks the impossible immediate solution to such a complex problem. Whilst agreeing that this is a much needed work, that no one in Russia has ever done – the big charities decided not to allocate any resources to it, leaving the issue untackled. So, how can we expect different results? 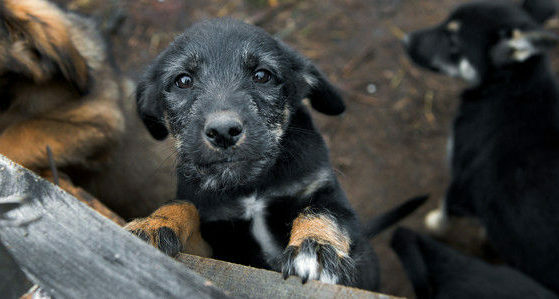 Until an established and well-respected NGO presents to the Government a properly (and realistically) budgeted comprehensive long-term programme, as an example of how to reduce stray dog population, or better yet, funds it, these atrocities will repeat, before every big event or every time a person gets attacked by stray dogs. These things are the every month news in many Russian cities: Yakutsk, Makhachkala, Tula, Khabarovsk – to name just the recent ones that come to mind. And just now the foreign media gets wind of it because it’s the FIFA World Cup. Many Russians don’t even care – they just don’t want to see dogs on the streets, and nothing else matters. Currently dogs are being captured at a small scale in most of the World Cup cities; shortly they will speed up the pace. The Event is only 5 months away. The Big Question is: Are we going to repeat the 2014 Sochi Olympics frenzy? When foreign rescue organisations were getting a lot of publicity for ‘Rescuing Sochi pups ’ and raising as much as $ 2500 to transport a single dog to the United States? The money that would have covered the cost of sterilization of at least 50 dogs, preventing thousands of puppies from being born to die on the streets. And most importantly, does this Band-Aid, the kindhearted public is happily paying for, really solve anything? It took decades and millions to build the infrastructure, to develop the culture and to establish organisations that underpin humane treatment of animals in countries like UK, USA and Western Europe. Real solution that will produce long-term results requires time and money, but we have to start somewhere! It’s as simple as that: if we don’t start now – Russia (and its animals) will be in the same (or worse) situation for the decades to come. What can be done now to prevent it right now? NOTHING. No petitions from outraged foreigners will stop this. Starting and signing online petitions to the Russian Government on international platforms, such as change.org or care2 is pointless, as they have no political power in the country, it may only help spread the news, but petitioning alone won’t change anything for the animals. However, if we start TODAY we can make a huge long-term difference that will avoid a lot of future suffering. Thousands of puppies and kittens end up on the streets because pet owners can’t afford to sterilise their pets. Mass sterilisation campaigns in the FIFA World Cup cities would be a great start. It is late, but it is not too late. Sterilisation of one dog costs £ 30, £ 20 for the cat. This means that in the warm spring months, when most puppies and kittens are born, thousands of births would be prevented and lives saved. This is the direct action that will reduce the amount of animals killed on the streets of Russia starting before the World Cup and continuing long after. You can donate here stating “FIFA strays” in the donation note and 100 percent of your funds will be spent on sterilisation and saving lives.